Kalanchyovskaya Street was named after Kalanchyovskoye field that was located in place where Komsomolskaya square is today. In XVII century there was a Tzar's road palace with a high tower - "kalancha" - in this field. This street is divided into two parts by Komsomolskaya Square. Until 1930's, there was a tramline in the part of the street which lead to the city centre. Then the first line of Metro was opened in 1935, and the tramline was removed. 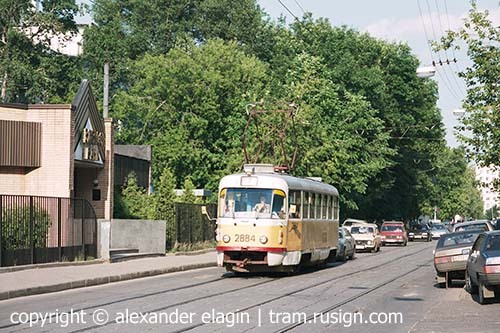 Simultaneously, there was constructed a new line in another part of the street, which surpassed the closed lines along Sadovoye Koltso, and this line is operating up to date. 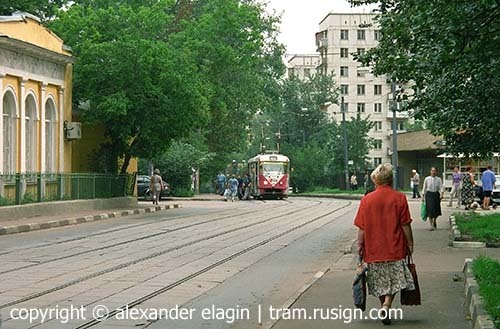 In 1954 a new tram terminus was constructed in Kalanchyovskaya Street, close to Kalanchyovskaya railway station. 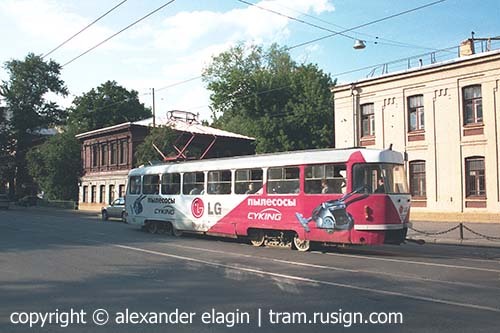 This loop with two tracks replaced the closed terminus that had been located near Kazanskiy Vokzal in Komsomolskaya Square. Kalanchyovskaya Street and Komsomolskaya Square are separated by a railway overpass. 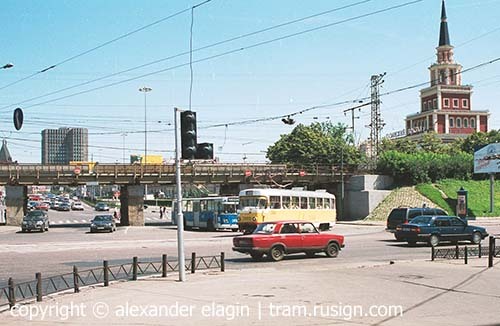 Here you can see a tram turning to Kalanchyovskaya Street; Kazanskiy Vokzal (railway terminal) tower is in the right, behind the overpass. Kalanchyovskaya Street. The railway station is 50 metres to the right, beyond trees. While looking similar, different parts of this building are of different age. The right (darker) one was erected in late 1970s, while the left part is a few decades older. To complete the picture, a glass skyscraper is, of course, the newest structure here, being a child of the first years of the 21 century. 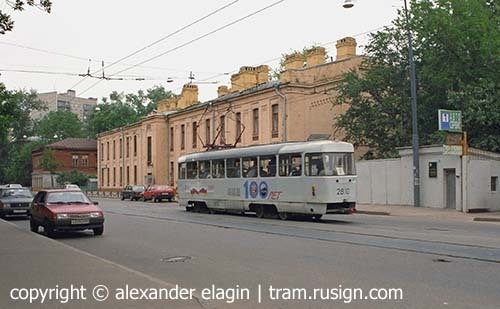 A tramcar decorated for the centenary of Moscow electric tram passes a rather interesting building with plenty of chimneys. The next brick-and-wood house is also a trace of a long gone epoch. 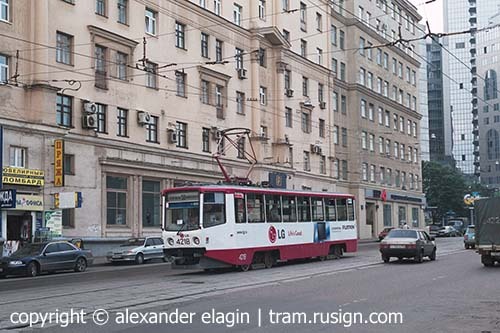 One can hardly guess how long such relics will survive in modern Moscow with its ever-increasing land value. 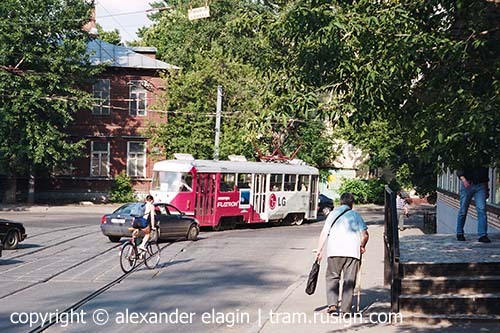 The tracks make a turn from Kalanchyovskaya Street to Protopopovskiy Lane. This junction used to be guarded with traffic-lights, but they are gone now for unknown reason. Another view of the previous crossing, now looking from Protopopovskiy Lane. 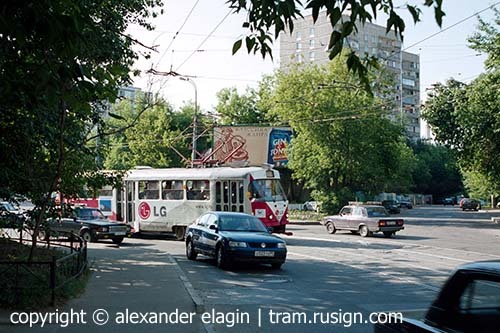 The tramline turns from Kalanchevskaya Street to Bezbozhniy Pereulok. Here you can see a crossing of this Pereulok with Astrakhanskiy Pereulok. An old hospital is to the left, and the modern blocks of flats one can see in the centre; they replaced an old district of small mansions in 1970's. 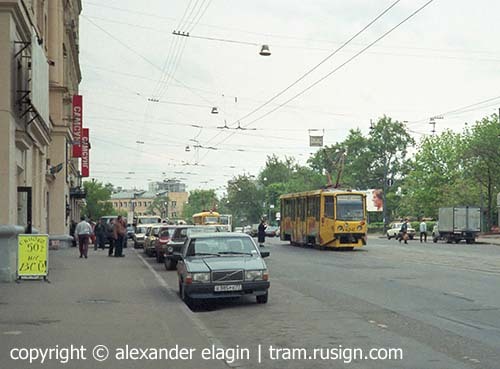 Long ago, the line in Protopopovskiy Lane would be used by almost a dozen routes. Now, just one route survives here, namely route #7. Motorists also find this lane to be a less congested bypass to broader trunk streets, causing in turn greater disturbances to tram traffic.